Fronted by the awe-inspiring Sri Maha Mariamman Hindu temple off Silom Road, Pan Road is a bastion of vegetarianism. Chennai Kitchen and A-Ma Kitchen are two of our favourite no-frills eateries serving strictly meat-free southern Indian and Chinese-Thai fare, but poke around and you’ll find a lot more. No shortage of colour on Pan Road. First settled by southern Indians some 150 years ago, the eclectic western end of Silom Road and surrounds has been dubbed one of Bangkok’s two “little Indias”. 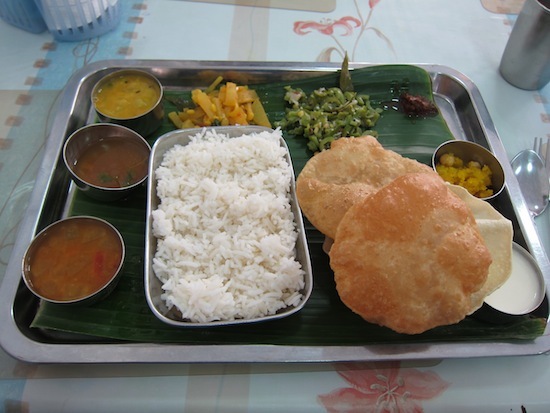 Descendants of the Indian immigrants who created Sri Maha Mariamman can often be seen dining in the vegetarian restaurants after making offerings to the temple’s principle shrine dedicated Maha Devi, the Hindu goddess of death. The hope is that Maha Devi might add a year or two to your life when she notices you being compassionate to animals by having a meatless lunch nearby. Whether you share this superstition or not, the vegetarian food on Pan Road is worth seeking out. Chennai Kitchen fills up at peak hours. Named after the Indian city formerly known as Madras, Chennai Kitchen opened in the mid-1990s and quickly developed a reputation for authentic southern Indian vegetarian fare. The tiny four-table shop’s walls are adorned with colourful pictures of Hindu deities and thought-provoking messages. One of the signs hints at the spiritual realm by proclaiming, “Arise! Awake! And stop not till the goal is reached!” Another reminds the small staff that “It takes months to find a customer but only a second to lose one”. It’s good advice for any entrepreneur, and judging by the warm attitudes and personable service that we’ve consistently received here, the owners seem to have taken it to heart. Chennai’s go-to dish is the South Indian Thali, a filling spread of lentil and veggie curries, sour and spicy radish, sweet couscous with chick peas, rich house-made yoghurt, intense sambal, fluffy poori and white rice. Served on a banana leaf that’s laid across a shiny stainless steel platter, the thali can be enjoyed with several to-die-for varieties of dosa, dosai and utthapam. 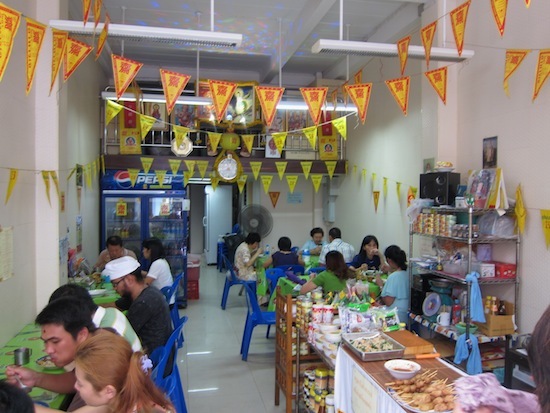 The thali runs 160 baht while other dishes go for 80 to 100 baht. Inside A-Ma — just look for the yellow flags. While southern Indian is this area’s most noticeable ethnic group, the many Chinese immigrants who also settled here are evidenced by a spooky Chinese cemetery found just up the road — and the Chinese-Thai food served in several no-frills eateries. 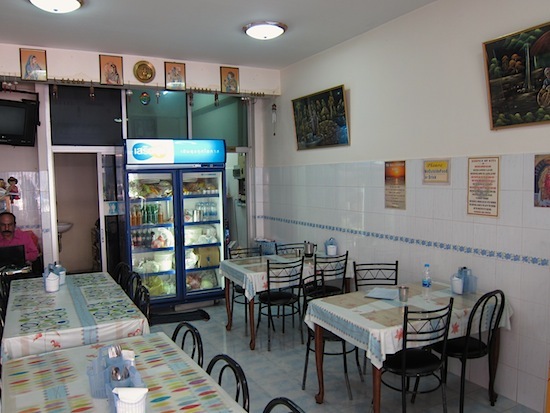 Occupying a similarly cheerful hole-in-the-wall next to Chennai, A-Ma Vegetarian Kitchen is marked by the recognisable yellow flags that signal “ahaan jay (vegan food) served here”. Run by an affable older couple, A-Ma’s colourful selection of vegan stir-fries and curries are displayed in massive trays and pots that front the street. 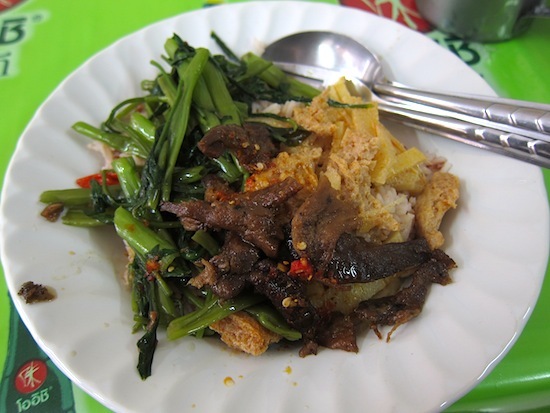 For a mere 10 baht for rice and 20 baht per item, you can pile on bitter melon soup, green curry, gaeng som (sour orange curry), stir-fried morning glory, fried mushrooms with garlic and a range of fake sausage, fish and other “meats” crafted from ingenious blends of vegetables and meat substitutes. Choosing between Chennai and A-Ma is tough enough, but the Pan Road vicinity hosts a number of other notably good vegetarian restaurants. Along with several other Indian vegetarian joints, these include the Middle Eastern Garden Cafe and charming Bonita Cafe & Social Club. Along with a full-on vegan brunch, the latter does international comfort foods like teriyaki burger and carbonara with vegan “bacon”. 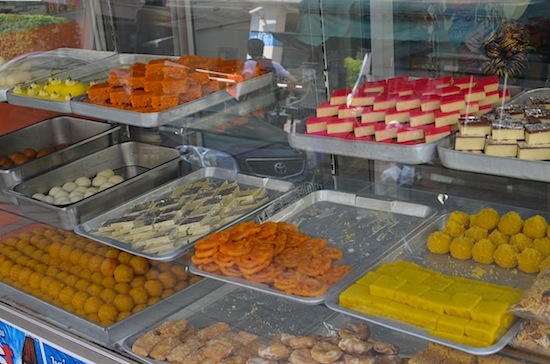 No matter which you choose, be sure to save room for the Southern Indian sweet shops and Chinese bakeries. To reach Pan Road from Surasak BTS station, take Exit 2 and hang a u-turn at the bottom of the stairs so as to head east on Sathorn Road. Marked by the Burma Embassy at the corner, Pan will be the second left, and you’ll start seeing vegetarian eateries after a five-minute stroll. 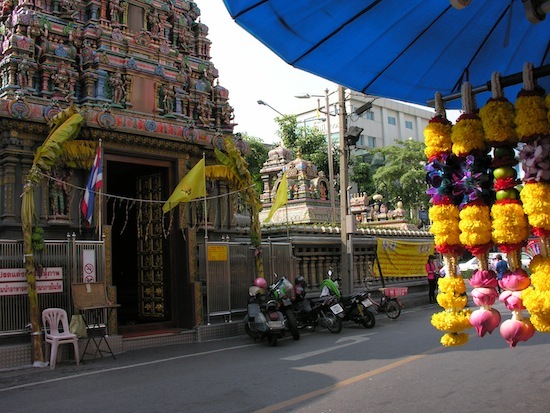 If coming from Chong Nonsi or Sala Daeng BTS stations, walk west on Silom Road until you reach Sri Maha Mariamman Temple on the left. Pan Road cuts north from there, with Chennai and A-Ma found almost immediately after the temple on the right. Last updated on 23rd April, 2017.